*The interview was conducted via e-mail on October 24th as a look back at LONDON BLUE's Hyper Japan debut and their thoughts on the event, as well as a look at how their current events are going to celebrate their major debut release. A big thank you to LONDON BLUE and Kiyoshi Hayashi for allowing Selective Hearing to have this opportunity once again. **Unfortunately, due to RINA's hiatus taking effect during the time this interview was conducted, she could not take part in answering the questions alongside the other members. This post has been cross-posted from Selective Hearing. Please be sure to check out the official post on the website! Made up of five members with a passion for the UK in both its sound and fashion sense, LONDON BLUE are a group known for their towel-waving moves and guitar-riff fuelled instrumentals in more than a few of their tracks. Though the group has been around since 2013, LONDON BLUE have only recently begun to make a name for themselves within the idol fandom thanks to their recent major debut with the King Records label, a company that distributes music for the likes of AKB48, Uesaka Sumire, TeddyLoid, Ogura Yui and more. Since the groups major debut on September 5th 2018, LONDON BLUE have been actively performing and promoting their single through in-store events and live performances whilst also taking on outside activities to further promote themselves individually. Unfortunately, member RINA announced her hiatus from the group on October 12th, 2018 in order to focus on her current acting projects. Furthermore, the youngest member RINKA announced her own period of rest on November 7th, 2018 in order to focus on her exam period and other side projects. 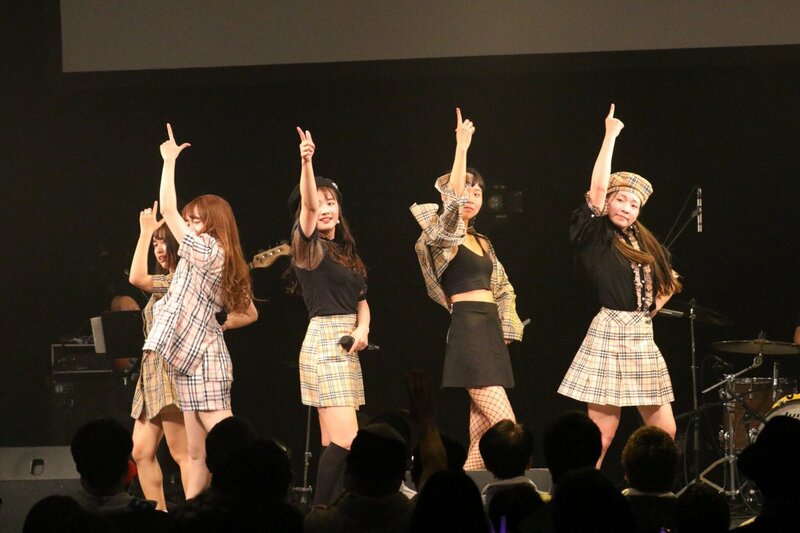 Due to both RINA and RINKA's respective breaks, LONDON BLUE is now operating as a three-member unit and actively promoting their new single to get their name out there. Now, just months after their UK debut at Hyper Japan Festival 2018 and a major release, LONDON BLUE return to Selective Hearing for a second round of questions to discuss their major debut single, fashion and their plans for the future as a group. What will we learn about the London-loving group today? - Welcome back to Selective Hearing, and thank you for agreeing to another interview. It’s been a while since you performed at Hyper Japan when we last met, so please tell me: How did you feel about your time in London and performing to the English crowd? KANA: Everything, from the concert to sightseeing was fun. During the concert especially it was really great getting to see the reactions of the fans. Getting to do the meet and greet event afterwards and directly exchange energy with everyone was really enjoyable, too. KAYANO: The London concert was different from our concerts in Japan, so I was happy to enjoy this time with everyone. It was like a dream! Although there is a difference in language between England and Japan, with music like LONDON BLUE we are all able to meet each other. That is something I will always treasure. KYOKA: Being able to perform in London in front of these fans and spending time with them was like a dream. RINKA: It was so much fun!! At first I was really nervous and anxious, but since there were only warm and welcoming fans there, I was able to enjoy myself completely. The view from the stage is something I am never going to forget and will always treasure. - I heard you were surprised by how many people came to the Meet & Greet event. Did you get to meet a lot of fans during your time at the event? KANA: When we got to the space for the event there were so many people there that I was surprised. I was really happy. KAYANO: Since this was our first time holding an event in London, I was really worried about how many people would be there. So, I was happily surprised to have my expectations exceeded! I am happy I was able to meet everyone! KYOKA: I was able to meet a lot of people. RINKA: I was able to take a lot of pictures and communicate with people, and now we are all connected by our voices from across the ocean! I would like to feel that way again. I was also surprised by the fans who were speaking Japanese. - Since returning to Japan you have also had your major debut events, congratulations! How does it feel to be under king Records and to promote your new single? KANA: I am happy to be releasing with King Records. It is too early to talk about the results, however. KAYANO: Thank you! King Records is an agency where a lot of artists I like are managed. I am happy to become a mentee of these artists whom I respect. And since King Records is a major recording company, we now have a professional feeling that I will try hard to never forget. KYOKA: Thank you. I am very happy. I will work hard to achieve even more. RINKA: Just reaching our major debut is not everything we can offer. I am going to work even harder to show all of our growth that is to come after this major debut has happened. - Speaking of your new single, do you have a favourite song? Mine is Itoshiki hibi no naka de. KAYANO: Thank you!!! I like Groovin'! This was our newest song at the time when I joined. I have unforgettable memories attached to this song because of that. KYOKA: I also like Itoshiki hibi no naka de. - What do you think is the appeal of your new single? Please promote it for the readers and fans! KANA: I really want people to understand the true meaning of LONDON CALLING! 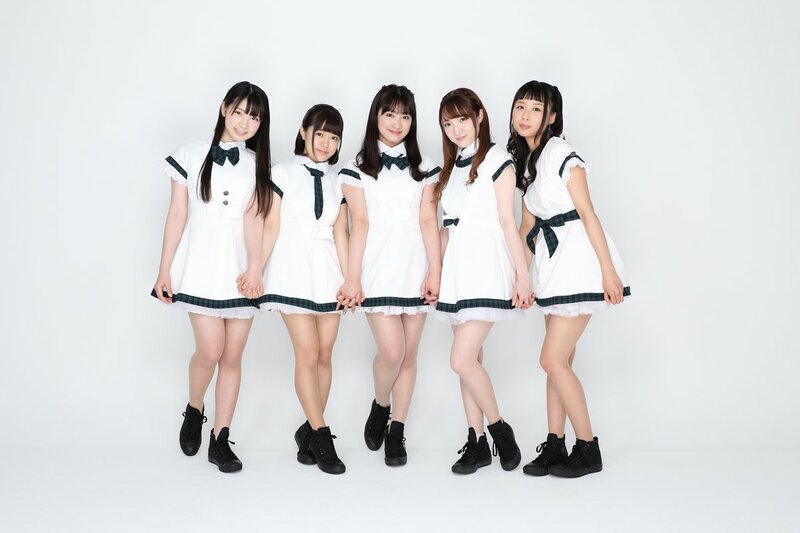 KAYANO: Fun songs, soft songs, and cool songs, LONDON BLUE can show all these various sides because LONDON BLUE are a cool & cute idol group! KYOKA: I think that our songs can appeal to people because they can cheer you up no matter where you are or what you are doing. - Will you be releasing any new material in the future? I would love to see another single from LONDON BLUE next year. KANA: We are working hard so that we can have another release! KAYANO: Please look forward to what we will do next! But I think that LONDON BLUE will become even bigger! KYOKA: That is a secret for now, but a good secret! - Thinking about your recent release events, is there anything memorable about your events and performances you have done since LONDON CALLING's release? KAYANO: I started wanting to showcase my performance as a professional! I worked a lot to strengthen my singing and dance skills!! RINKA: I enjoy it when we have the towels that fans swing around to bring up the energy, so I would like to make everyone from the stage to the audience hurt from swinging the towel. KANA: We have several outfits! KAYANO: We harvested the idea of Burberry Check in order to give our outfits a London feeling! Even my casual clothes are Burberry Check, and I have a Union Jack parker that I like wearing. It’s because I like London in general. KYOKA: We have a lot of outfits. I would like everyone to see LONDON BLUE in a variety of costumes. RINKA: We decided altogether to combine the Burberry Check pattern with the British motif. I am looking forward to wearing these very London-esque outfits. - As a group you are known for your ‘cool & cute’ style, right? In terms of fashion, who has the coolest style and who dresses the cutest? KYOKA: Our leader KANA is the coolest while RINKA and myself are the cute ones. KAYANO: Because we all adopt different types of style, we are all fashionable! KYOKA: Everyone is stylish and cute (laughs). RINKA: Even though our way of dressing might be different, we are all very stylish, I think! - By the way, I never asked this in our interview at HYPER JAPAN… but do you have a favourite English word or phrase? KAYANO: Beautiful and thank you! RINKA: Our life is our art. - I think it would be nice to hear about the songs that inspire you, so, is there a group, singer or song from the UK that you really like right now? KAYANO: Ever since I joined LONDON BLUE, I have fallen in love with The Beatles songs! Originally my father was a huge fan of them! So, whenever my father would listen to their songs, I would always listen with him and came to know their music. Now, I like and know their songs a lot more. RINKA: I like One Direction's songs. - And what sort of groups do you like that are from Japan? KAYANO: I like cool female singers like Namie Amuro or Kumi Koda! I also really like anime song singers! Nana Mizuki, LiSA, Mamoru Miyano. KYOKA: More than groups, I like to listen to a variety of self-made artists. RINKA: I like rock bands. - Do you think that LONDON BLUE will return to England soon? I hope to see you live again one day, either at HYPER JAPAN or on your very own London stage! KANA: We will definitely come back! We will be working hard for that to happen! KAYANO: I also want to come back to England! I don’t know when we will be coming back but we are always somewhere near you! Be it in HYPER JAPAN or a solo concert! KYOKA: I strongly want to come back. RINKA: I definitely want to come back. I want to see that scenery one more time! I want to taste that air again, and I want to do more sightseeing and get to know London better. - Finally, please leave a final word to the readers! Charm everyone with your cool & cute auras. KAYANO: There are not really many idols out there who are singing UK ROCK. It may even be that LONDON BLUE are the only group doing it. Among UK ROCK groups, LONDON BLUE is striving to be the best idols out there with our authentic Japanese cool & cute selves. I think that we are going to have a lot of concerts, even in London, going forward! If you can, please come to even just one LONDON BLUE concert! KYOKA: Our time in London in July this year for our concert was a really special and lovely time. We will be working hard to give a memorable performance that only LONDON BLUE can deliver. We are also on Twitter and other forms of social media where we give other types of performances, so please look out for them. We are coming back to London so please wait for us! RINKA: I will be working hard from now on so that I can make it back to standing on a stage in London. I want so many people to be able to see our performance. I also want us to communicate with and get to know many more people and for the group to grow. I want it to be that if you say the word “idol” to someone in London, they immediately think of LONDON BLUE! I will be working to make that day come! If we get to come back to London, I would like to be able to meet you all again at our next concert. I love you, London!!! - Thank you for your time and effort, everyone. We look forward to LONDON BLUE's future events and success!